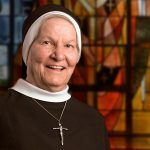 “I’ve been stitching over 50 years,” says Sister Viola Marie Spire, a member of the Sisters of the Most Precious Blood of O’Fallon, Missouri. 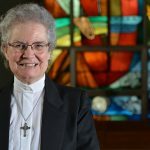 For most of her religious life, she has served in her community’s Ecclesiastical Art Department, making liturgical vestments, paraments, and stoles. 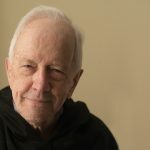 “I entered religious life at 25,” says Father Michael Gantley, a member of the Order of Friar Servants of Mary (Servites) in Chicago, Illinois. “That was considered old at the time,” he recalls, laughing. 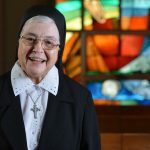 Sister Geraldine Vogel, 84, a member of the Sisters of the Most Precious Blood of O’Fallon, Missouri, is a testament to “on-the-job” training.